Successfully Added Car Video DVD Player - 1-DIN 4.3 Inch LCD Touchscreen Display to your Shopping Cart. 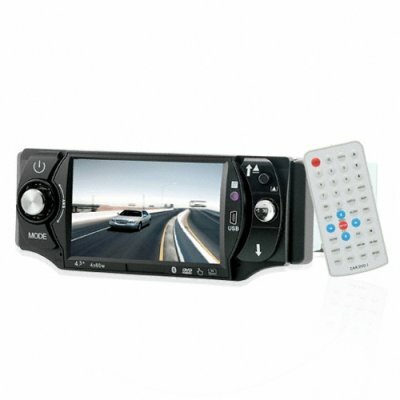 Car Video DVD Player - 1-DIN 4.3 Inch LCD Touchscreen Display. Single DIN sized (50mm tall) vehicle DVD player with 4.3 inch touch screen for playing all your digital media and featuring bluetooth connectivity with your mobile phone for safety while driving. With such features as a detachable screen with case, excellent compatibility with many digital formats and disks, and a built in worldwide-use analog TV tuner, this compact sized car stereo DVD player packs a lot of entertainment value into a small package. A great wholesale price makes this car stereo DVD player perfect either for the resale market, OEM market, or personal/company use. As always, it is proudly available from your source for wholesale direct from China electronic products, Chinavasion.